The Campaign for Real Ale (CAMRA) is consulting members on what the future for the campaign should be. These are komadori’s thoughts on the matter, which have been submitted to the consultation. CAMRA should be prepared to welcome the availability of good ale, cider and perry in social venues other than pubs. 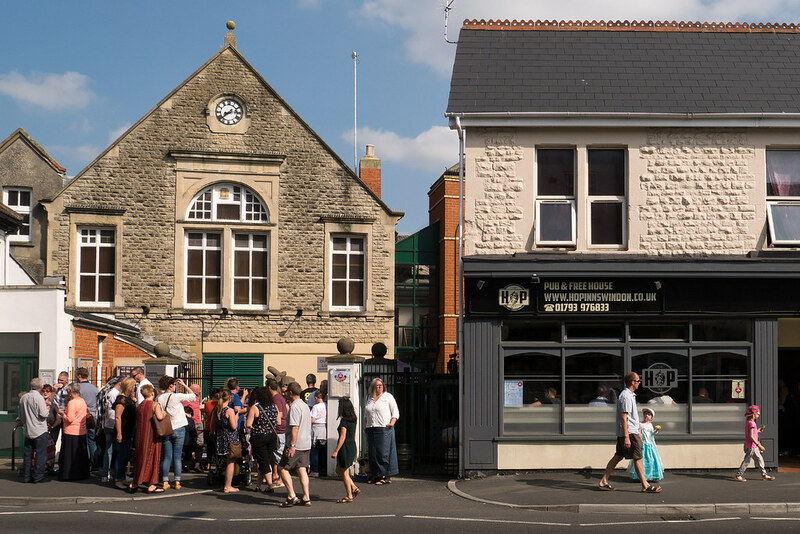 I noted the comment in ‘Shaping the future’ that “Coffee shop chains are beginning to diversify by selling alcohol, posing a further threat to the traditional pub.” I think CAMRA should welcome a diversification in the venues allowing people to enjoy good ale, cider an perry socially. With most pubs, even newly built ones, offering an environment of ersatz Victoriana, is it not time for the more modern establishments that offer real ale? It also offers a means by which people that have abstained from alcohol might discover the pleasures of good ale. I look forward to the first entry for a coffee shop in the ‘Good Beer Guide’. The campaign should continue to support real cider and real perry, but I would not be against that support being in the form of helping an independent organisation take that campaign forward. There’s no reason for the campaign to widen its aims to cover all alcohol drinkers: good quality wine is widely available without CAMRA’s support. Old Town was alive on Sunday afternoon with visitors wandering between the venues of the Sausage and Ale Trail in Swindon Old Town. The event, to raise funds for the Christmas lights in Old Town, was fortunate with warm sunny weather. With entertainment and market stalls in Wood Street, several pubs were offering sausages — usually served outside — to eat along with their beer. Several shops also had promotions for the day. The Hop Inn was perhaps the most fortunate. 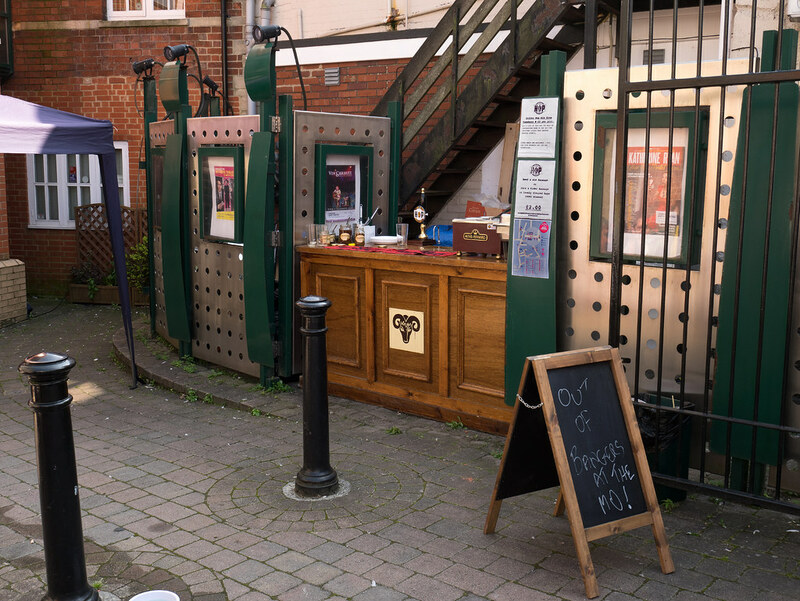 With the Arts Centre next door also being a licensed premise, it was able to sell sausages and beer from a counter facing the Arts Centre serving the small crowd watching the entertainment there. For other pubs, it was more discreet, in some cases so discreet that one wondered whether they were worried the event might disrupt their normal Sunday lunch trade. So busy was the Hop Inn that it ran out of sausages and had to get an urgent re-supply. A crowd and queue soon formed once they had restocked. Yet another pub for East Wichel? It’s less than a month since Swindon Borough Council granted planning permission for Marston’s Inns to build a pub-restaurant near the Croft Road entrance to East Wichel — on Langdean Road between Blackhorse Way and Frogden Road. Councillors criticised that application saying “it wouldn’t win any architectural awards”. [B]eing situated beyond the boundary of Witchelstowe (sic) it is beyond the remit of the Design Code….Materials and features have been specified to reflect some of the guidance within the Design Code, whilst retaining an appropriate degree of separation. It’ obvious from the drawings that actually very little effort has been put into the design at all. Imagine an unadorned prefabricated concrete box, and you’ll have a fairly accurate idea of what this building will look like. In comparison with this, Marston’s planning application was positively imaginative. Anyone wishing to comment on or object to the application must do so by 29 September. Comments and objections can be submitted online. Today the Adver has reported that Marston’s Inns has submitted a planning application for a pub at East Wichel. Despite what the Adver says, I can’t yet find the planning application on Swindon Borough Council’s website. The only information on it I can find is in the minutes of the March meeting of the Wichelstowe developers’ community forum. What this pub won’t be is one that’s at the centre of the community. It’s on a plot — designated as a ‘commercial plot’ in the East Wichel masterplan — right at the edge of the development. Indeed, once Blackhorse Bridge across the motorway is opened, it’ll be not much closer for most East Wichel residents than the Check Inn in North Wroughton — the two pubs will stand almost opposite each other separated by the M4. With the new pub including a 180 seat restaurant — dwarfing the Check Inn’s 30 seat dining area — it’s clearly aiming to serve rather more than just the local community. The Check Inn has had a fairly chequered history of late, with landlord’s struggling to make a success of it — Fuller’s are advertising it to let at the moment. A vast new pub nearby, just across the motorway, may be good for the residents of East Wichel, but for those of North Wroughton it’s likely to bring further disappointment. The news that Archers Brewery has, for the third time, gone into administration is, sadly, not really surprise. It’s just because of its previous struggles to stay in business. Nor the fact that at times visitors have found that they literally couldn’t organise a piss up in a brewery. The problem was it’s beer range. Their beers were nice enough ,but try placing a repeat order. With a total of 190 beers brewed over thirty years, outside of their core range of four beers, other beers came and went in little more than a month. Archers isn’t the first brewery to fail through thinking that the best way to serve the guest beers market is to constantly change their range. Having failed three times, if it’s resurrected again perhaps it will finally learn its lesson and give its drinkers a more predictable choice. I’ve never really understood the urge brewers apparently have to give strong brews silly names. Despite the folks at Hayles Fruit Farm clearly suffering from this ailment, I’m pleased to say that their Badgers Bottom cider, which I purchased today from their stall at Swindon Farmers’ Market, is a highly drinkable medium cider. Having spent much of yesterday walking along the Kennet & Avon Canal, may I commend The Mad Hatter Tearooms at Avoncliff for a most delicious cream tea. All the better for a mistake in their taking my order which lead to it being free. Quite how one can misinterpret ‘A ham, cheese and pineapple hot baguette please.’ (also delicious) for ‘Two cream teas and a ham, cheese and pineapple hot baguette please.’ I am still pondering. The Cross Guns pub just across the way may be better known and have a better range of beers, but the quality of its food and service — of the ‘lets fleece the tourists for all we can get’ type with hurriedly prepared food on paper plates and plastic cutlery — are distinctly second rate. By comparison, at The Mad Hatter china crockery and steel cutlery are the norm and, even on a busy sunny bank holiday weekend, time was taken (tho’ not excessively) over the preparation of the food. The Black Rat Cider was quite good too. May I recommend Windsor Castle Brewery’s Green Man beer… real ale for lager drinkers. I also commend the Hogs Back Brewery for the choice of colour for their steam-powered dray. Blogging will be light and/or inconsequential for the remainder of the week, whilst I continue an in-depth study of British beers. If the government continues to believe it is doing so well on being ‘tough on crime, tough on the causes of crime’, why the continuing growth in private and now semi-public security? Swindon has not only the bouncers seen on pub and club doorsteps throughout the country, and the security staff employed by the local pubwatch, but now we also have a new ‘Street Team’ employed by the inSwindon company, a company backed by Swindon Borough Council, the South West Regional Development Agency and the public-sector New Swindon Company. Any doubt as to the latter’s role is dispelled by the images used on the inSwindon website. Not all at the same time, I hasten to add. I took a day-trip to Looe in South East Cornwall yesterday and very enjoyable it was too. Excellent food and beautiful weather. Sadly, the same cannot be said of the journey home. When I boarded the 16:41 Virgin Trains service from Liskeard, I noticed that the seats in half the carriage I had entered were taped-off. A little later the customer service manager came and told us the reason was that on the way down to Newquay there had been some passengers who were ‘a bunch of animals’ and had been ‘sick all over the place’. He apologised for the smell (which was hardly noticeable) and said if we wanted to move to another carriage, we could (an offer not repeated later in the journey when the train was fuller). A little inspection showed that a fair amount of vomit (and other rubbish) remained. Once home, a quick look at the timetable* showed that the train had spent most of the day (five hours) sat at Newquay. Apparently not enough time to clean the carriage — what little smell there was coming from the taped-off area was definitely of vomit without a hint of disinfectant. I appreciate that facilities at Newquay station are limited, but were a mop, brush and disinfectant not available? It has recently been announced that Virgin Trains have lost the cross-country rail franchise to Arriva. With service like this, I doubt that many of the travelling public will be disappointed. * Links are to pdf documents.